I’ve recently rambled a bit about why I am a writer. However, that doesn’t look at the question about why I write. Or, in fact, why anyone else writes. C. S. Lewis famously declared that as a child he was “driven to write by a severe deformity of the thumb”, which he was implying he wasn’t dextrous enough for manual labour. He probably didn’t need to claim that, though. The man clearly had a love of words and story and polished his word-smithing over many decades. Having a story to tell is one of the best reasons to write. People like to read stories. A good story can save bad characterisation better than the other way around. And while best seller novels are usually well-written by authors who know their craft, there have been some stellar successes recently that aren’t. 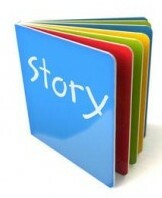 Rather, the basic story is captivating enough to make them sell. I found myself wondering recently if I am a writer because I write, or I write because I’m a writer.